They took things very seriously in the 1970s. Well, some things anyway. And two of those things were video art and feminism. In art terms, there was the whole postmodern emphasis on parody and pastiche going on. With video, though artists might have enjoyed the playfulness of exploring a new medium and freeing performance art from the one-off event, the resulting work was often somewhat po-faced. And of course, challenging the longstanding notion that a woman’s place was in the home, where she should be chained to the kitchen sink, metaphorically at least, wasn’t to be taken lightly. 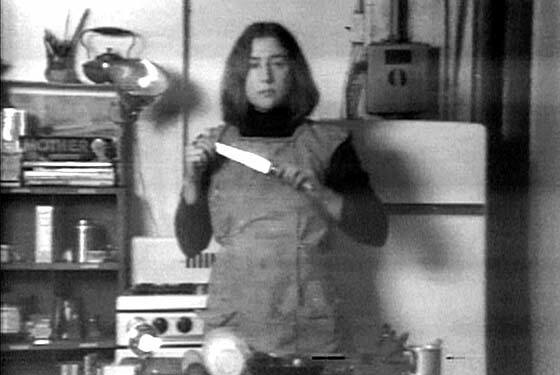 In Semiotics of the Kitchen, Martha Rosler demonstrates an alphabet of kitchen equipment getting further and further from their expected uses as she does so; here the knife is a signifier of violent stabbing not careful slicing. That Rosler does this with a stern look and serious demeanour makes the work watchable and funny, though the laughter is often slightly nervous as Rosler’s gestures become more and more angry and stirring is abandoned in favour of stabbing. This entry was posted in Feminism, Film/Video, Performance, Politics and tagged art, Martha Rosler, performance, Semiotics of the Kitchen, video by Ann Jones. Bookmark the permalink.